Woodwork exports increased sharply in Q1, partially thanks to higher demand from the US. However, experts say this may not be good news for the industry. 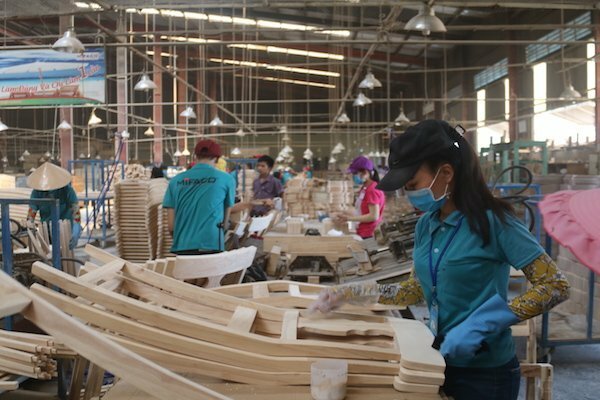 The Minister of Agriculture and Rural Development’s report about the farm produce market in March showed that Vietnam exported $872 million worth of woodwork in March, raising the total woodwork export turnover in Q1 to $2.3 billion, an increase of 15.6 percent compared with the same period 2018. The woodwork export growth is described as very ‘encouraging’ if noting that the exports of farm produce in general are sliding. Not only maintaining the 2-digit growth rate, woodwork also has the highest trade surplus value, $1.02 billion in Q1, among farm produce. The US, Japan, China and South Korea continued to be the major export markets for Vietnam which consumed 80 percent of total exports. The exports to the US saw the highest growth rate of 34 percent compared with the same period last year. MARD said the US-China trade war has helped Vietnam’s products become more competitive than Chinese products of the same kinds which are taxed. According to Dien Quang Hiep, chair of the Binh Duong provincial Wood Processing Association, the US is one of the biggest export markets for Vietnam, while China is a big supplier of material timber of Vietnam. In the US-China trade war, US companies tend to seek wooden products from Vietnam instead of China. Meanwhile, China, which cannot sell finished products to the US, will shift to sell timber materials to Vietnam. Some woodwork manufacturers confirmed that orders from the US have increased rapidly in recent months. Hiep, who is also the director of a woodwork company, hopes his company will have turnover increase of 10 percent in 2019, to $22 million. While woodwork exporters are excited about new big orders from the US, analysts have warned that the increase could be a worry rather than joy. They said the trade war had brought great opportunities to Vietnamese enterprises in the short term. However, it could be a threat in long term, because the massive investment from China to Vietnam could lead to problems. According to experts, Chinese enterprises could bring their products to Vietnam and export them to the US as Vietnamese products. If the US discovers trade fraud, Vietnam’s exports may become involved in misfortune. Observers say that China has been relocating their production bases to Vietnam for the last few years, especially in Binh Duong and Dong Nai provinces. However, the relocation has sped up since the trade war broke out. A report from Forest Trends shows China is the second largest foreign investor in Vietnam in the woodwork industry.